Your child will have a private, one-on-one lesson five days a week, Monday through Friday. Your class will be no longer than 10 minutes each day. He or she will have the same 10-minute time slot each day. This schedule is key to the retention of skills. Much is accomplished in a short but intense private lesson, which will be individualized to meet your child's needs and abilities. Since most children fall into water unsupervised and while they are fully clothed, your baby/child will eventually learn to perform the Self-Rescue skills while fully clothed. 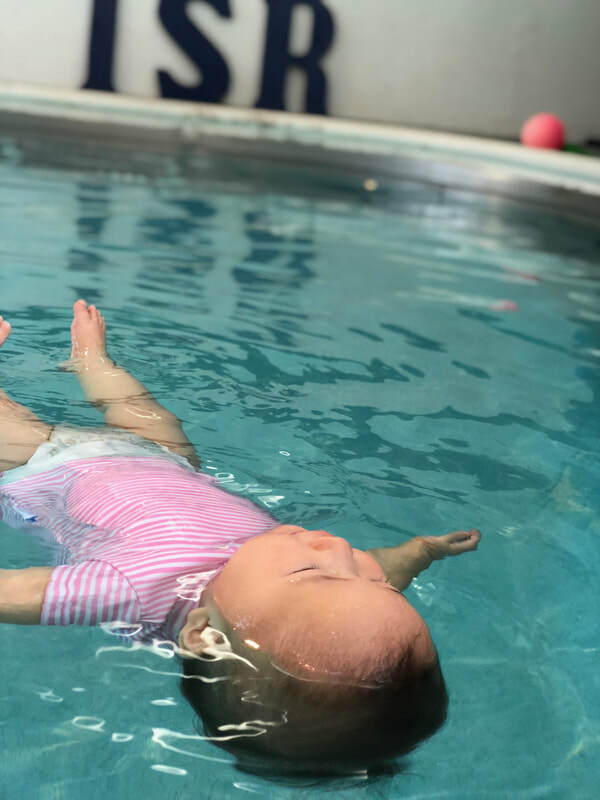 Upon completion of their initial lessons, every child should take a refresher class every 6 to 12 months to help your child adjust his swimming and floating skills to his developing body size. The refresher classes can be as short as 1-2 weeks. Ask about discounts for First Responders and Military Families. Infant Swimming Resource (ISR) is the safest provider of Self-Rescue (TM) swimming lessons for children 6 months to 6 years of age. Going beyond traditional swim instruction, ISR teaches children how to survive in the water. For 50 years, ISR has been teaching children critical Self-Rescue (TM) skills -- giving children the competence and confidence to safely enjoy the water. ISR's technique teaches babies and children how to save themselves if they were to end up in the water alone. At ISR, your child's safety is our first priority. Each lesson is uniquely tailored to your child's needs based on comprehensive assessment. Because every child learns at his or her own pace, your child will be gently guided through each skill level. 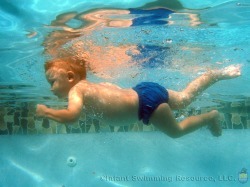 ISR's Roll-Back-to-Float Sequence from Infant Swimming Resource on Vimeo. ISR's Swim-Float-Swim Survival Sequence from Infant Swimming Resource on Vimeo. There is no substitution for ADULT SUPERVISION. ISR believes pool fences, supervision, and pool alarms are important parts of a necessary multi-layered approach to drowning prevention. However, traditional lines of defense break down, and the over 4,000 drowning deaths per year bear a grim testament to the fact that traditional approaches are missing a key component: the child. ISR’s core conviction is that the child is the most important part of a drowning prevention strategy and our over 300,000 ISR graduates and 800 documented survival stories are proof that children can save themselves. Children are curious, capable, and have an uncanny ability to overcome obstacles like pool fences; at ISR we take that ability and teach them skills to potentially save themselves if they find themselves in the water alone. Your child is not the only one who will learn during lessons. Infant Swimming Resource's program includes comprehensive parent education on aquatic safety and drowning prevention.